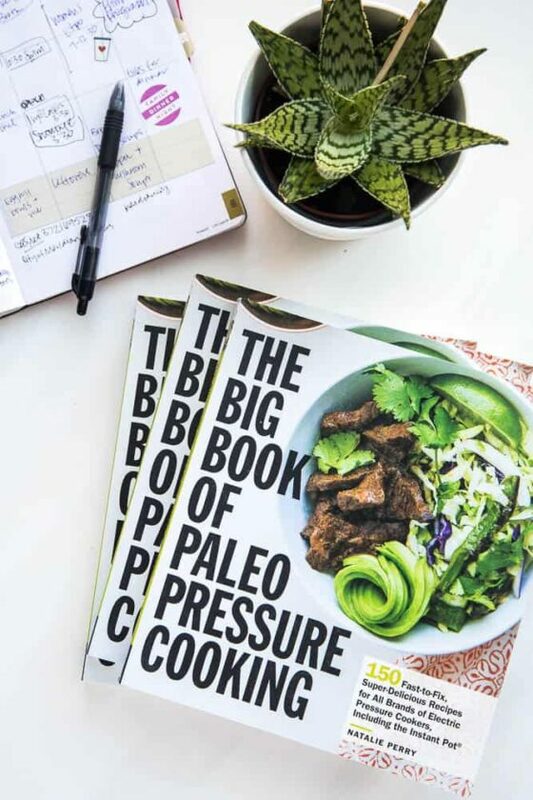 Disclosure: This recipe is in partnership with Sprouts Farmers Market. I received monetary compensation for my time and all opinions shared are my own. Take a deep breath. Can you smell that? It’s the smell of Halloween being OVER. It might be one of my favorite smells — righht up there with clean kids’ rooms and four hours home alone. One of my other favorite smells is roasted fall vegetables. You know I’m completely bonkers about roasting stuff. OF COURSE there’s going to be roasted vegetables on our Thanksgiving table; it’s a total no-brainer. Yes, it takes up precious oven space, but these can be roasting while the turkey is cooling off. 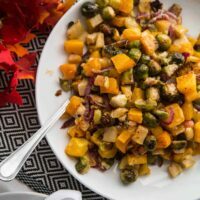 In this mix of roasted fall vegetables we’ve got butternut squash, Brussels sprouts, thinly sliced red onion, and apples. Yes, apples. 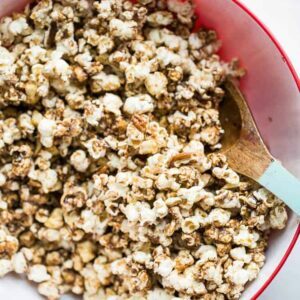 It’s kind of the secret ingredient in this recipe, and every so often you’ll get a pop of sweetness that will surprise you. You’ll wonder why you don’t throw apples into every roasted vegetable dish you make. I love butternut squash and apples together especially. Like in this Apple Squash Soup with Bacon. I ALSO love apples and cheese together, so it would only make sense that butternut squash + apples + cheese = rainbows & unicorns. Let’s talk about the SMOKED GOUDA. I can’t even begin to tell you how that smoky cheese transforms these vegetables. 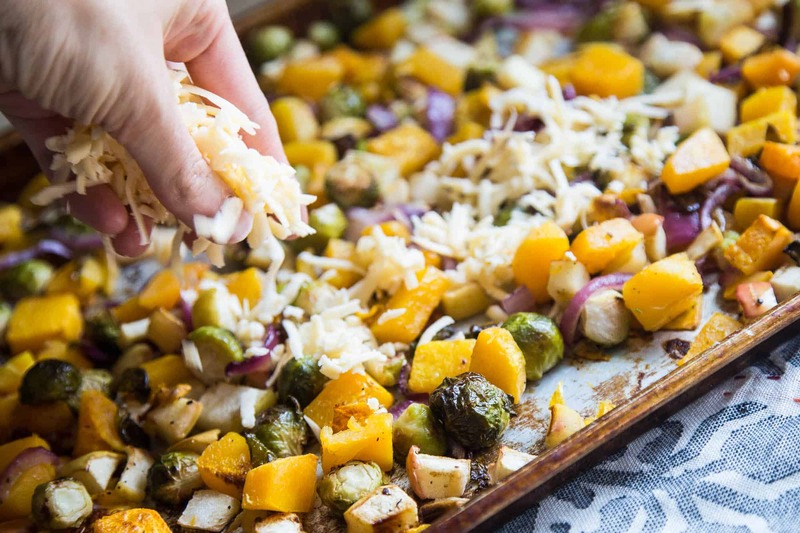 I sprinkled some shredded smoked gouda over the vegetables when they were nearly done roasting. 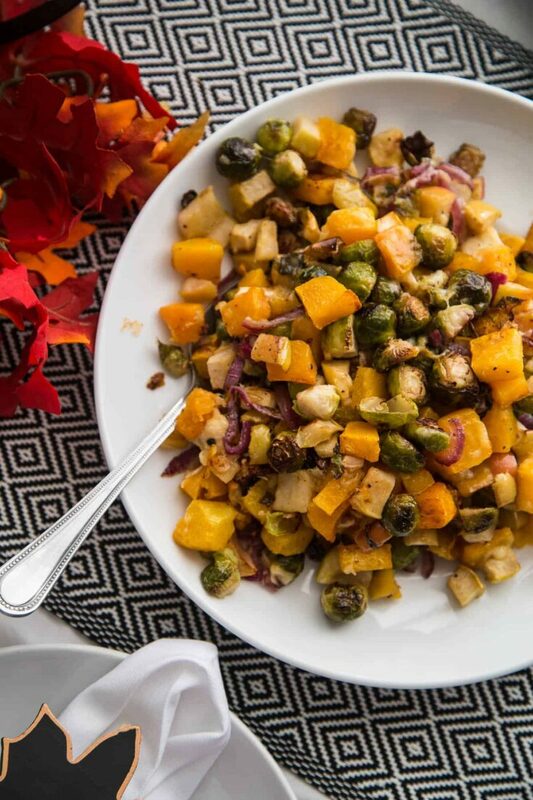 The good news is that these roasted fall vegetables are gluten-free! 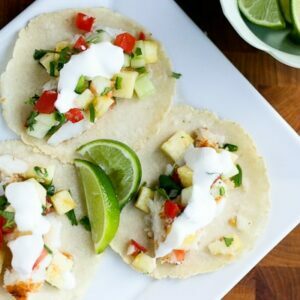 This recipe is included in Sprouts Farmers Market’s November Deals of the Month Flyer! 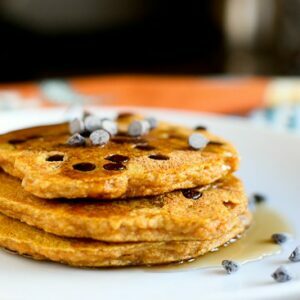 You can find a whole slew of gluten-free Thanksgiving recipes in there, and you can find all of the ingredients to make this recipe at Sprouts, too. Don’t tell the turkey, but this dish might upstage that diva. P.S. 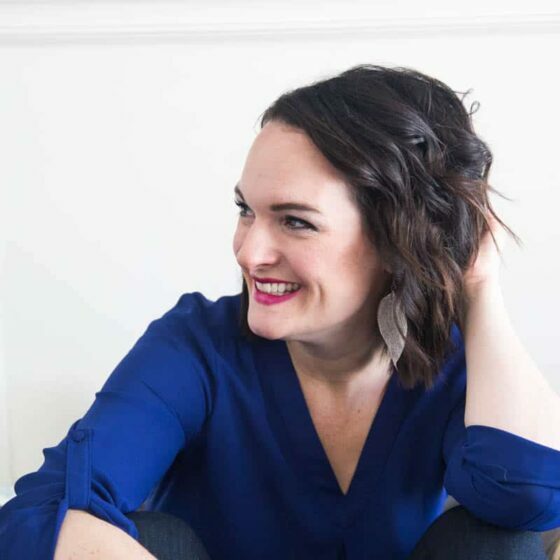 If you need it to be Whole30 compliant or dairy-free, just leave off the cheese. It’s totally delicious that way, too. There's nothing better than the smell of roasted fall vegetables, no? 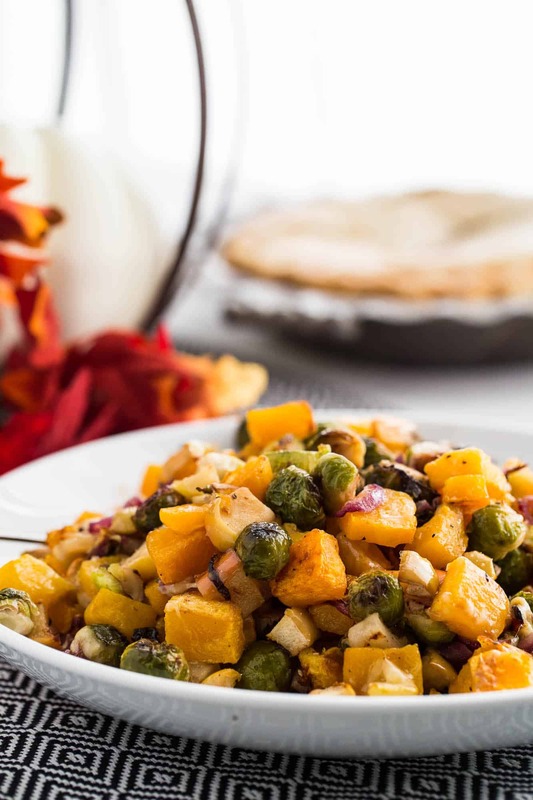 This easy side dish would be a perfect addition to your Thanksgiving table! 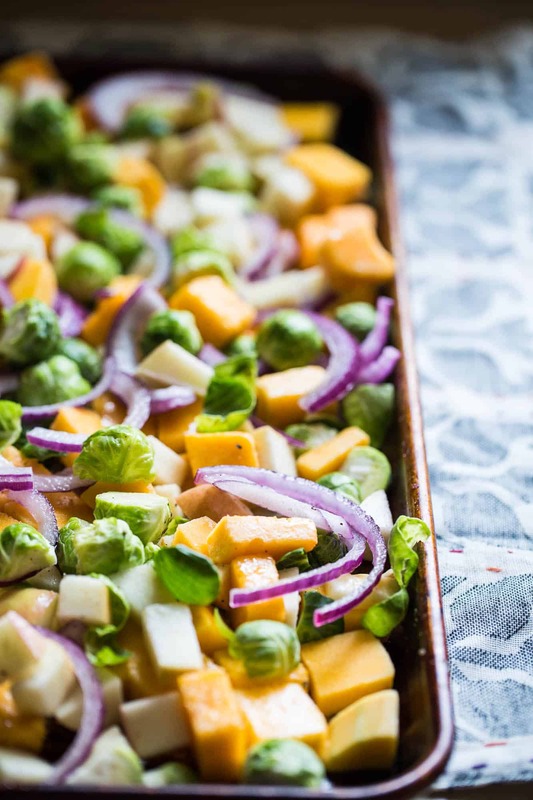 Pile the squash, sprouts, apples, and onions on one large, rimmed baking sheet. Drizzle the avocado oil and lemon juice on top; add the salt and pepper. Use your hands to toss everything together, and then spread it all evenly on the pan. Roast for about 35 minutes, flipping everything around a couple of times during roasting. The squash and apples should be soft and everything should have golden brown spots at this point. Sprinkle the cheese over the top and return the pan to the oven for 5-8 more minutes until the cheese is melted and bubbly. Transfer everything to a serving dish and serve hot. I love roasted veggies so this is calling my name. The apple and gouda in this sounds like the perfect match for the veggies. Thanks! Apples + cheese is one of my favorite things! This looks like fall on a plate! YUM!